Back when I danced competitions, we didn’t add rhinestones to our costumes. We didn’t have fake hairdo’s and fake eyelashes. We didn’t all have exactly the same makeup… Nowadays, those are all expectations of competition dancers. As if our little girls aren’t growing up too fast as it is!! 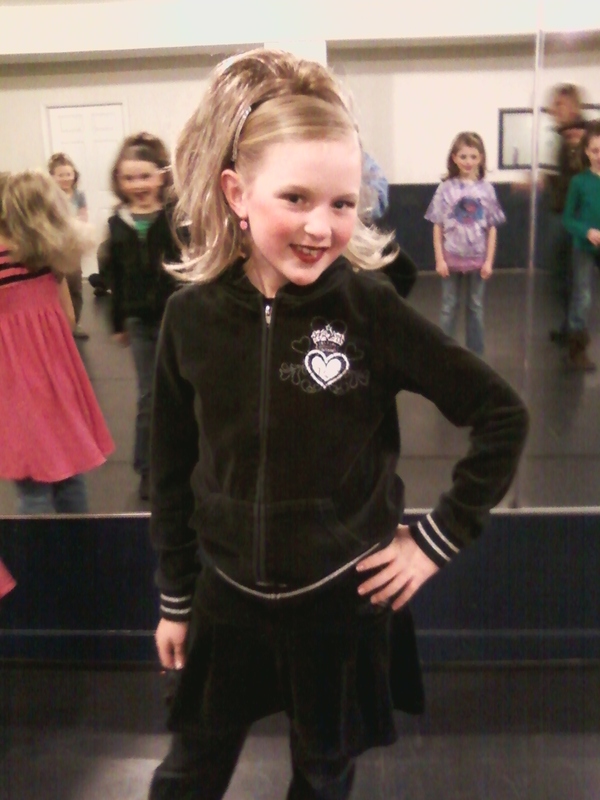 I do have to admit though, when we went to the meeting to learn how to do the hairdos and makeup so they would all look the same, Grace DID look pretty cute! Life as a Dancem0m is about to get seriously crazy! Next weekend, the girls have a make-up dance class Saturday. Sunday, they are performing at the Kids’ Expo in Eau Claire. Immediately following their performance (the first of the year), they have a stage rehearsal. Pretty much every weekend after this, and until the end of May, (when we have our recital) is going to be busy with dance related events. The only exception will be Easter weekend, which is busy enough as it is! Oh yeah… competition season is about to begin! What does that mean? I am rhinestoning Grace’s costume! Her Pink Panther costume is made of velvet. For the record, Gem Tac, while it is supposed to be “the best” rhinestone glue, still does not stick well to velvet!! It has been a major pain in the you-know-what! Admittedly, her costume looks very cute with the extra rhinestones, but still… I am probably at 4 hours or so, and that is just on one costume! I am glad that Grace’s dad agreed on doing her other costume. According to Grace, that one was very easy to do (they did it together). It probably sounds like I am complaining, I’m really not… I don’t know how much all this rhinestone, makeup, fake hair, etc is going to pay off, but I’m sure excited to see them dance! It has been great for Grace so far, and it’s sure to get even better as the weeks go on!! Previous 4 down…. 20 To Go Next Stop and Smell the Roses… What Roses? ?